Blue Lagoon City Hotel is the newest addition to the Group and the first hotel to be open all year round. This four star luxury hotel with modern guestrooms and suites located in the heart of Kos, only a 5 minute walk to the harbor, town square and shopping district. The Spa offers a beautiful and tranquil environment to rejuvenate and indulge all senses. The hotel is ideal for couples, incentive groups as well as business travelers, offering a comfortable and pleasant environment. The hotel’s 133 modern guestrooms offer twin beds or double bed, satellite TV, minibar, coffee/tea making facilities, free WiFi, telephone with direct dial, free safety deposit box, individual air condition / heating units, bathroom with shower, telephone, bathrobes and slippers, hairdryer and bath amenities. There are standard rooms, junior suites and an executive suite available. 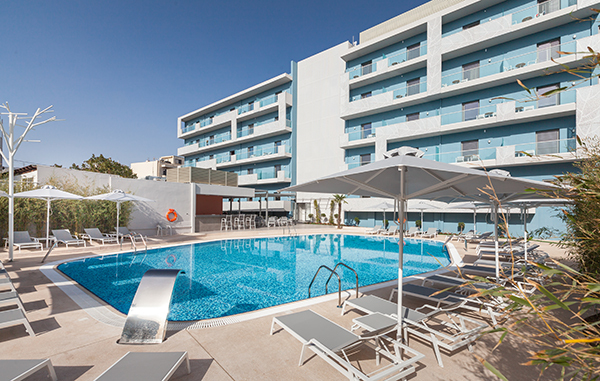 In the Blue Lagoon City Hotel there is a choice of two restaurants, the main restaurant and the pool restaurant. The hotel offers also two bars, one in the lobby area and one in the pool area. There is a main pool and an indoor pool in the spa area. The spa offers various spa treatments, massage and beauty treatments. For sport the hotel has a gym available.